These are the firsthand accounts of sisters Helen and Barbara Shores growing up with their father, Arthur Shores, a prominent Civil Rights attorney, during the 60s in the Jim Crow south Birmingham district---a frequent target of the Ku Klux Klan. Between 1948 and 1963, some 50 unsolved Klan bombings happened in Smithfield where the Shores family lived, earning their neighborhood the nickname 'Dynamite Hill.' Due to his work, Shores' daughter, Barbara, barely survived a kidnapping attempt. Twice, in 1963, Klan members bombed their home, sending Theodora to the hospital with a brain concussion and killing Tasso, the family's cocker spaniel. The family narrowly escaped a third bombing attempt on their home in the spring of 1965. The Gentle Giant of Dynamite Hill is an incredible story of a family's unfair suffering, but also of the Shores' overcoming. This family's sacrificial commitment, courage, determination, and triumph inspire us today through this story and the selfless service, work, and lives of Helen Shores Lee and Barbara Sylvia Shores. 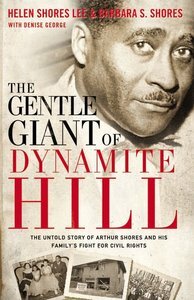 About "The Gentle Giant of Dynamite Hill"
Judge Helen Shores Lee was born in Birmingham, Alabama, to Arthur and Theodora Shores. She has been married to Robert M. Lee, Sr. for fifty years. Judge Lee and her husband have two sons, one daughter, and five grandchildren. They are members of First Congregational Christian Church where she formerly served on the Board of Trustees. Barbara Sylvia Shores was born in Birmingham, Alabama, to Arthur and Theodora Shores. She is mother of adult twins. Barbara has been employed with the Jefferson County Office of Senior Citizens Services for 26 years and is presently the Executive Director. She graduated from the University of Illinois in 1968 with her Masters in Social Work. Barbara is a member of the First Congregational Christian Church; Birmingham, Alabama.